An accessible tutorial on the concepts of hypermedia APIs along with a plain-Ruby implementation example. If you’re new to RSpec and/or Rails, this is an extremely detailed tutorial on TDD with RSpec. Some tips and wisdom on finding performance issues in your apps, along with practices to use to build your own approach. Not everything from 2.2 through 2.4 is implemented yet but there’s a helpful table of what is and you’re encouraged to contribute more. We mentioned Sinatra 2.0’s release in last week’s issue, but here’s the official announcement with more background. A test-focused approach of detecting dreaded N+1 issues before they get into production code. The final part of a 3-part series on Unicode that addresses normalizing strings to avoid confusion and security issues. Both are non-urgent bugfix releases only. In this free eBook you will learn how to debug a memory leak on Heroku. A Leanpub book on developing 2D graphical games that's free to read online. Fixes an issue from Rails 5.0 where thread_mattr_accessor variables were shared with subclasses. 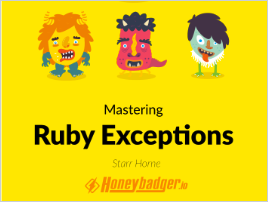 A look at Result objects for more explicit exception handling. Keep your team busy building your app, not solving ops headaches. Unlimited deploys, immediate roll-back & more. Having a lot of nested controllers can make the routes file a mess. Here’s one story of cleaning up these routes. A way to separate routes into files to remove noise in large Rails apps. Quickly determine set membership, such as an object in a cache or similar store.